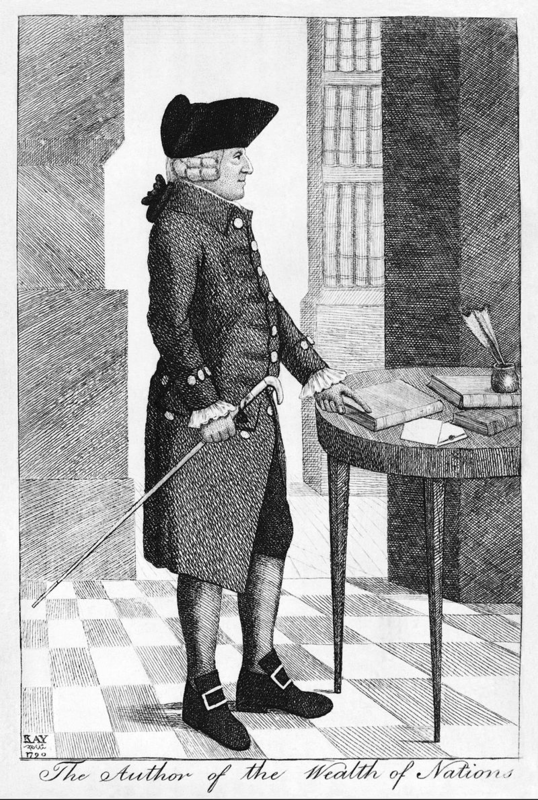 Adam Smith, drawing by John Kay, 1790. My Besterman lecture was a highly critical assessment of Adam Smith’s views on famine. In The Wealth of Nations (1776) Smith claims that in a free market economy famines will never occur. The famines that do occur are, according to Smith, the result of misconceived government interventions to prevent famine – a striking example of unintended consequences. Smith’s argument is that grain harvests never completely fail (as potato harvests do – but Smith does not consider the potato, which was not yet the main crop in Ireland). In a year of relatively bad harvest, price rises serve to ration the consumption of grain, and thus make the limited supply last through the year. Famines occur when governments artificially lower prices and thus cause supplies to run out. Two texts have stayed in my mind as I have tried to get a grip on Smith’s views on famine. The first is Edward Thompson’s extraordinary essay, “The Moral Economy of the English Crowd” (1971), which introduced the term “moral economy” which has taken on a life of its own. Thompson’s article was a vigorous defence of those who rioted in support of demands for reductions in grain and bread prices – he and Smith are, two hundred years apart, arguing on opposite sides of the question. The other is Amartya Sen’s Poverty and Famines (1981). Sen argued that famines can occur when there is no shortage of food if particular groups within the population lack the resources to access food. His classic study was on the Bengal famine of 1943 where more than two million died, even though the harvest had been adequate. On Sen’s account inflation caused by the war economy was the primary cause of famine, but the famine could easily have been prevented if the government had distributed grain to the starving. Sen’s argument is directly opposed to Adam Smith’s in that it shows that markets do not work to produce the best possible outcomes when it comes to the distribution of food. Smith claimed to know a good deal about famine, and he wrote when the question of whether there should be a free market in grain was being vigorously debated. In France the physiocrats had argued for a free market, a policy which had been tried and had failed. In England 1774 was a year of bad harvests, accompanied by food riots. Smith was quite right to think that England, where there was a relatively free market in grain, had not seen anything resembling a famine in his lifetime. But he completely failed to consider Ireland, where severe famines happened frequently. Worst of all was the famine of 1740-42, which killed 10% of the population, or 300,000 people. Smith had every reason to be familiar with Irish famine, for Jonathan Swift was one of his favourite authors and he had surely read Swift’s Modest Proposal (1729 – there were two copies in his library), suggesting that the Irish poor should breed children as livestock, to be consumed by the wealthy. Swift’s solution to the problem of starvation in Ireland was (in appearance) a perfect example of free market economics in practice. Why did the Irish starve? For reasons that would have been familiar to Sen: because neither the government nor landlords intervened effectively to prevent the famine taking hold. In England, on the other hand, there were elaborate interventions, not only to feed the feeble and the unemployed, but also to subsidise bread for the poor and to distribute it free. 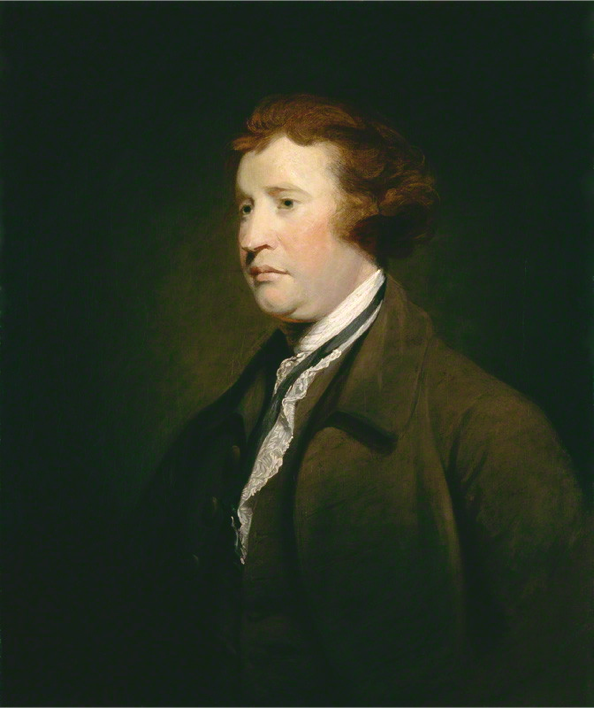 If we turn from Smith’s Wealth of Nations to a slightly later text, Edmund Burke’s Thoughts on Scarcity (written during the near-famine years of 1795-96, and published posthumously) charity is given a central role in preventing famine. Burke, Thompson and Sen have very different views, but all acknowledge precisely what Smith denies, the need for intervention to prevent famine in years of bad harvest. Smith himself published tables showing just how extreme the movement in grain prices was in bad years. Smith was right – the harvest very rarely fell more than 25% below the average, and there was always just about enough food to go round. But Smith was also fundamentally wrong: the working poor could not afford to feed themselves in bad years, and were dependent on charity to survive. Why was Smith unwilling to acknowledge the role of charity in preventing famine? I am afraid the answer has to be that his commitment to free market arguments was so dogmatic that he was unwilling to look with an impartial eye at the evidence. Smith was wrong, and his mistake had extremely serious consequences as it influenced policy towards famine through the nineteenth century. 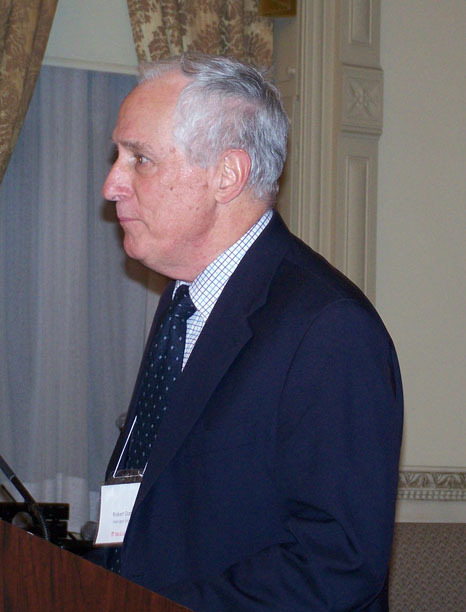 This month Oxford University will award an honorary doctorate of letters to Robert Darnton, a (if not the) leading cultural historian over the past 50 years of eighteenth-century French publishing, book trade and literary culture. I count myself as one of the many scholars inspired by his works. The Great Cat Massacre (1984) was among the first scholarly works I was assigned to read upon beginning postgraduate study. As a doctoral student, I benefited from his advisement (as a doctoral student at Columbia, I enrolled through a university exchange in his Princeton seminar on ‘The Social History of Ideas in Eighteenth-Century France’). And now as a senior research affiliate of the Voltaire Foundation and General Editor of Oxford University Studies in the Enlightenment, I take particular interest in expressing on behalf of the Voltaire Foundation our collegial pride, admiration, and respect for Professor Darnton on this occasion. Indeed, I would like to highlight some of his impact on the Voltaire Foundation – though, unlike the Public Orator, I will not do so in Latin! Darnton entered into the field of eighteenth-century studies at Oxford in 1960 as a Rhodes Scholar. 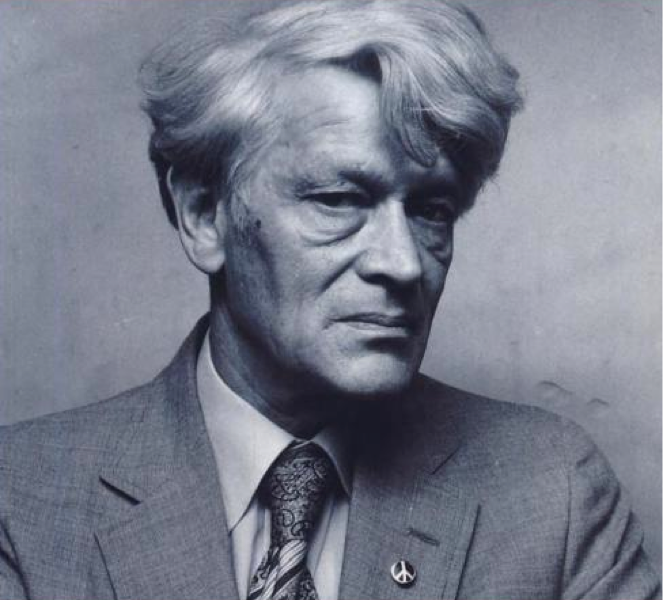 He thus entered the field at a moment of dynamism and growth: just a few years earlier (1955) had seen the launch of what became Studies on Voltaire and the Eighteenth Century, and just a few years later would bring the initial International Congress on the Enlightenment (1963). Darnton remained at Oxford to complete his doctoral thesis (in 1964) on radical political pamphleteering in the 1780s. 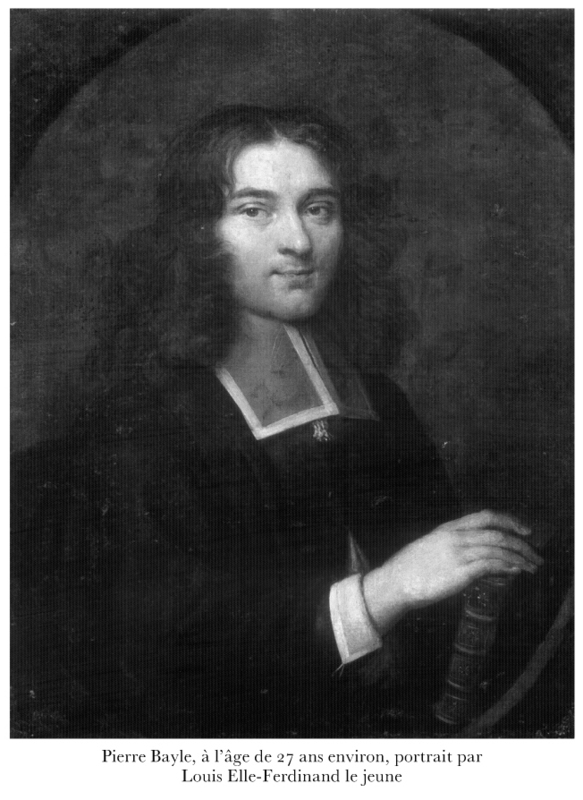 Moreover, under the influence of Oxford faculty Robert Shackleton and Richard Cobb, he conducted his first research on J.-P. Brissot and the rich police, book trade and censorship archives. These lines of research led directly to the seminal articles and books he would publish after taking up a position at Princeton, including Mesmerism and the End of the Enlightenment in France (1968), The Business of Enlightenment (1979), and the Literary Underground of the Old Regime (1982). This body of work alone would justify the recognition of an honoris causa doctorate. Darnton however remained both directly and indirectly engaged with Oxford and the Voltaire Foundation. In 1983 he was elected to the executive board of the International Society of Eighteenth-Century Studies and served as its president from 1987 to 1991. He was instrumental in bringing the ISECS meeting to Budapest before the fall of the Berlin Wall, and in establishing the East-West Seminar for early career scholars, which he directed until 1995. The proceedings of both the ISECS Congresses and the East-West Seminars were in those years published in SVEC. This includes Darnton’s 1991 presidential address, ‘Reviving the Republic of Letters’, SVEC vol.303, p.3-16, just one of at least six talks or papers he contributed to SVEC volumes between 1988 and 2003, before the series adopted its all-book format – and even after, he continued to contribute, penning a preface to Thierry Rigogne’s Between State and Market: Printing and Bookselling in Eighteenth-Century France (2007). Darnton served two terms on the Voltaire Foundation board, in 1987-1991 and 2000-2007; during the latter term, he was an instrumental contributor to the conception and initial funding of the Electronic Enlightenment, launched by the VF before being moved to the Bodleian Libraries and distributed by Oxford University Press. 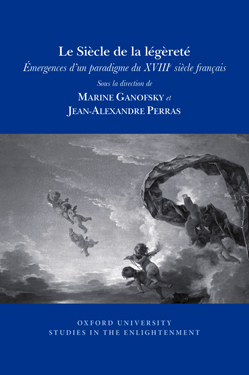 During this period, he also authored and edited the Voltaire Foundation’s first foray into digital publishing, a fully on-line monograph and document collection, J.-P. Brissot, His Career and Correspondence (1779–1787) (2001). 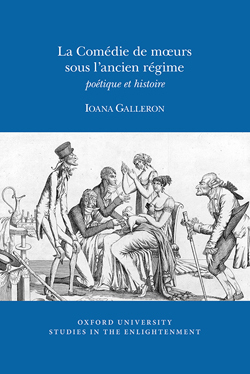 The 13 original essays in this volume assess the many facets of his work (to that point; he has published four major scholarly books since then, and another – his long-awaited survey of the French book trade in the eighteenth century – is expected next year!). Darnton here provided a response which, although far too early in his career to be a valedictory, nevertheless offers a lucid and compelling narrative of his own ‘two paths through the social history of ideas’. It is, I think, fair to say that neither path would have been possible, for him or for those of us who have been able to follow him into this still-vibrant field, without the institutions that he helped build and maintain. 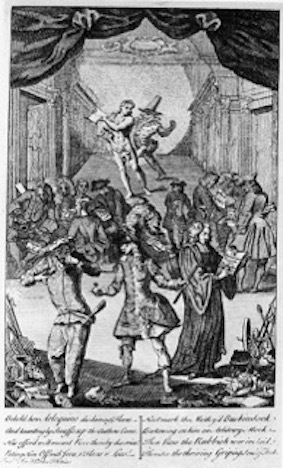 And it is to such institutions as the Voltaire Foundation and Oxford University Studies in the Enlightenment and the Enlightenment values that they espouse and embody, on the occasion of Darnton’s honorary degree awarded at the annual Encaenia ceremony, that we recommit ourselves in a celebration of ongoing renewal. NB listen to Robert Darnton speak on the subject of ‘fake news’ in the eighteenth century. Pourquoi la comédie de mœurs fleurit-elle de 1680 à 1720? A cette question, l’histoire littéraire répond habituellement en évoquant le déclin de la France dans les dernières décennies du règne de Louis XIV, années de crise spirituelle et économique, favorisant la multiplication des escrocs en tous genres et le délitement des valeurs, à leur tour reflétés dans la comédie. Pourtant, tous les thèmes de la comédie de mœurs préexistent largement cette période charnière entre les deux siècles, et j’en ai trouvé plusieurs illustrations dans des pièces des années 1630 ou 1640, dont je parle dans mon ouvrage La Comédie de mœurs sous l’ancien régime: poétique et histoire. Au-delà, se dessine même une tradition multiséculaire, remontant à l’antiquité grecque et latine, habituée à faire rire, de façon plus légère ou plus grinçante, d’un ‘aujourd’hui’ méprisable par rapport à un ‘hier’ idéalisé. En restant plus proche de la période charnière mentionnée plus haut, il suffit d’ouvrir les Satires de Boileau pour y découvrir tous les personnages caractéristiques de ce type de pièces: le financier indûment enrichi, le médecin assassin, le laquais parvenu, le procureur fourbe, le noble désargenté et prêt à se mésallier, la coquette. 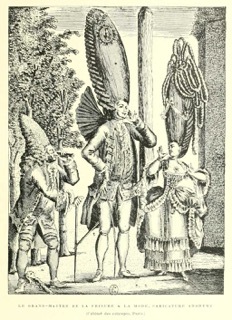 En changeant de genre, on lit dans L’Histoire amoureuse des Gaules plusieurs scènes dignes de la comédie de mœurs, que Bussy-Rabutin donne pour ‘vraies’, mais qui semblent surtout avoir beaucoup emprunté au théâtre, avant de l’inspirer en retour. Pour ne donner qu’un exemple, on peut mentionner l’épisode de la séduction par l’argent, que Lesage devait avoir en tête en écrivant son Turcaret: le financier Paget, significativement désigné par le sobriquet ‘Crispin’, se fait précéder chez Ardélise par une lettre accompagnée d’une généreuse ‘subvention’, et qui lui ouvre à coup sûr le cœur et surtout le chemin du lit de la belle dame. L’ensemble du roman relève d’une esthétique de la médisance, Bussy expérimentant ainsi, avant les auteurs de la comédie de mœurs, une écriture qui crée un univers littéraire à partir d’une vision a priori, comme un pur exercice de l’esprit. L’enjeu n’est pas de fournir une lecture juste de la réalité, mais de faire illusion, en canalisant le regard du lecteur ou du spectateur uniquement vers les éléments qui confirment la perspective noire posée, sans tenir compte de tout ce qui l’infirme ou la nuance. Ainsi, il est peut-être plus légitime de voir dans la comédie de mœurs non pas le résultat d’un déclin des mœurs et des goûts, mais la continuatrice d’une pensée classique. Celle-ci reprend à son compte d’anciennes critiques sur la modernité corruptrice, la couple avec la vision chrétienne du monde comme vallée des larmes, et décide de porter jusqu’à ses limites cette lecture sombre de l’humanité, en lui donnant une tournure décidément comique. Mettant au service de la satire son arsenal de types et de procédés, elle élabore une version policée, recevable si l’on peut dire, d’un jeu que l’on avait reproché à Bussy-Rabutin et à Boileau de pratiquer comme une attaque ad hominem. La représentation d’un monde d’où les principes moraux et la vertu ont généralement et définitivement disparu, à tous les échelons de la société, dilue les responsabilités et étouffe le scandale. Avec son côté absurde de neverland, la comédie de mœurs tire la représentation vers la farce. Sur fond d’essoufflement de la machine à caractères de premier plan, elle est certainement apparue aux comédiens comme une alternative de nature à relancer le théâtre et à renouveler le plaisir du spectateur.